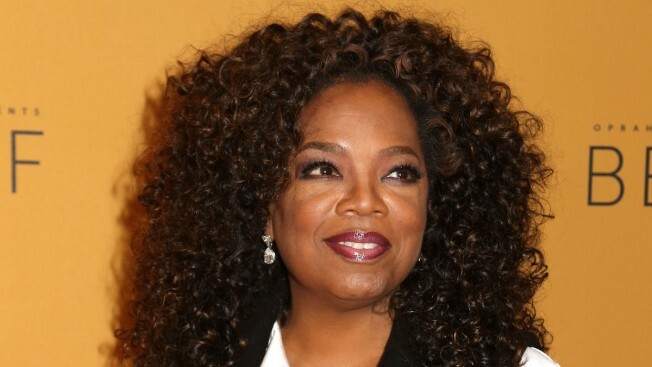 Oprah Winfrey purchased a stake Monday in Weight Watchers. Oprah Winfrey, who has publicly struggled with her weight for decades, is going on a diet again. But this time she stands to gain a lot of money from her efforts. The deal is already paying off: Weight Watchers shares more than doubled after the partnership was announced, earning Winfrey about $45 million on paper. Winfrey will use the Weight Watchers mobile app and work with a personal coach, the company said. She has also agreed to let Weight Watchers use her name, image and likeness for its products and services. Additionally, she will make appearances on the company's behalf. Weight Watchers is no stranger to celebrities. It has paid singers Jessica Simpson and Jennifer Hudson to promote its plan. But the deal with Winfrey is a shift to focus on overall health and wellness, rather than just dropping pounds. "We are expanding our purpose from focusing on weight loss alone to more broadly helping people lead a healthier, happier life," said Weight Watchers President and CEO Jim Chambers said in a statement. The company has been hurt by the popularity of fitness trackers and other health apps. MyFitnessPal lets users track steps, workouts and the amount of calories they eat for free on its app. Buying a FitBit tracker unlocks similar free online tools. Weight Watchers charges for its online food tracking, and weekly meetings and weigh ins have been a hallmark of its plan. Its shares were down 73 percent for the year through Friday. The company's earnings have fallen every year since 2011. To boost its earnings, the company announced $100 million in cost cuts earlier this year. Winfrey's weight has yo-yoed over the years, and she's been very open publicly about her struggles with dieting. In fact, weight was a frequent subject of her talk show, which ended nearly five years ago after 25 years on the air. In 1988, a thin Winfrey famously walked out on stage wheeling 67 pounds of fat in a wagon, representing the weight she lost. But her weight has fluctuated over time. Her weight was still an issue as "The Oprah Winfrey Show" came to an end. She told the TV interviewer Barbara Walters that one of her goals was to "make peace with the whole weight thing." Since then, Winfrey has talked about being uncomfortable with being the subject on the cover of her magazine because of her weight gain. Winfrey can now trade weight loss tips with her best friend, Gayle King. The host of TV news program "CBS This Morning" told her Instagram followers five weeks ago that she joined Weight Watchers. Last week, King indicated in an Instagram post that she had lost more than seven pounds on the plan. Representatives for Winfrey and King did not respond to requests for an interview. Meanwhile, Weight Watchers is hoping to tap into Winfrey's ability to turn ordinary products into the latest trend. A stamp of approval from Winfrey during her talk show was powerful. Books she recommended skyrocketed up best seller lists and products shown on her holiday gift guide episodes would sometimes sell out. But it might be harder to get her message across now. "She has less contact with people on a daily basis," said Craig Garthwaite, an assistant professor of strategy at Northwestern University's Kellogg School of Management. In 2012, for example, Winfrey relaunched her book club, but it doesn't hold the same power. "Most people don't know that it exists," said Garthwaite. Besides the OWN network, Winfrey reaches fans through O, The Oprah Magazine and Oprah.com. She also has a strong social media following with more than 29 million followers on Twitter, 11 million on Facebook and 4 million on Instagram. The Weight Watchers endorsement is a departure for Winfrey. Throughout her talk show reign, Winfrey did not make money off endorsements, Garthwaite said. Since leaving the talk show, she has also lent her name to Starbucks Corp., which sells Oprah-branded tea drinks. Winfrey is buying about 6.4 million shares of Weight Watchers at $6.79 per share. She will also receive options to buy an additional 5 percent of the company's fully diluted shares. She is also joining the company's board. Shares of New York-based Weight Watchers International Inc. soared $7.13, or 105 percent, to close at $13.92 Monday.